We don't know yet what happened, but too many people came to the conclusion that something smelt fishy. This column for the Canberra Times worked through the issues . . .
We haven't yet heard from Arthur Sinodinos. He may well be able to explain exactly why he was worth $200,000 a year to Australian Water Holdings, in addition to the prospect of making $20 million from his shareholding. He asserts he’ll be vindicated. This may well be the case. And $2,000 an hour is hardly an unheard of amount either; a top QC or someone with Sinodinos’ contacts might expect such remuneration. But . . . But . . . Being in the clear legally doesn’t mean your actions will pass the public bar test or, more to the point, be acceptable to voters. The standard applying to a Director is different to that applying to an MP and this is less stringent than the one for Ministers of the Crown. Particularly those responsible for dealing with our finances. It’s perfectly reasonable to be paid for your services. The key question is; what have you actually done and how have you created value? The only proposed transaction in this case appears to have involved the revaluing and selling of assets. That’s why Sinodinos was key. He possessed the contacts and skill to guide a deal through: the hoped for sale of an asset at a profit. It’s a perfectly legitimate undertaking. But the look and surrounding smell seems so wrong. Why does a company donate $75,000 to a political party that has the power to make this deal go through? And how could the Chairman of a company donating such a sizeable sum be unaware of this substantial sum - particularly as he also happens to be the party’s Treasurer? Donations that large normally manage to get some attention. It’s surprising this transaction passed over someone normally so clever and meticulous. The Australian Institute of Company Directors runs a terrific little course about the duties people accept when they become directors. Some of these are precise and codified in law; others are vague, implicitly depending on an individual’s interpretations of what the various stakeholders want. The point is Sinodinos may well be cleared as a Director but the current hurdle he has to jump is set higher. Although it’s unfair, the Assistant Treasurer can’t get away by simply pleading he’s done nothing illegal. The political burden of proof is tougher. The vast majority of people go into politics because they believe in something. The problem comes when they begin mistaking what’s in their own best interests for those of their party. No-one’s indispensable. Those who climb the gilded ladder discover the higher they rise; the less willingness there is to forgive. 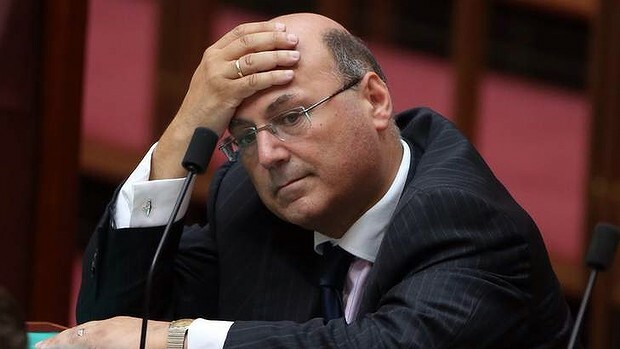 An ordinary MP may have been able to weather the storm that was whipping up around him, but there was never any way an Assistant Treasurer could possibly tough it out, no matter how lovely Sinodinos is as a person. It’s a duty of care issue. The hoops a politician has to jump through in order prove their suitability to occupy a position are considerably greater than those applying to an ordinary company director. The Chair of AWH might, quite reasonably, act in ways that a Minister with financial responsibilities never would. Nevertheless it took until midday Wednesday before the government accepted reality and Sinodinos fronted the media. And this is what this column’s really all about. Political stakeholders. You and I. We elect politicians to represent us. We invest them with the power to determine the social structures within which our lives will play out. This is an incredibly important trust - something far more consequential than simply maximising value. We expect them to meet a higher standard and that’s why, politically, Sinodinos is being held to account. Our only mistake is to see this as being in some way unusual. When John Howard became Prime Minister he implemented and enforced a Ministerial Code of Conduct. This saw him quickly lose four members of his front bench team. Graham Morris, Howard’s Chief-of-Staff at the time (before Sinodinos took the position) made his own decision to leave, too. In Morris’ case it wasn’t about corruption - there was none. It was rather his own, straightforward assessment that remaining in the job wasn’t in the best interests of the government. He believed he needed to go; so he went. Critically, his actions were in the best interests of the stakeholders - not himself. It’s about time some other MP’s decided to act in others’ interests as well. I’m told Kevin Rudd had, originally, perceived he’d play a role of elder statesmen in both parliament and party – just as Singapore accords former PM’s a title (Senior Minister) and allows them to act as Minister’s without portfolio. But that was never going to happen. Realisation of this prompted his resignation. Others in Labor should move too. They’re standing in the way of talent. Stephen Conroy’s activities offer simply the most glaring example of exactly why it is political parties never seem to manage to regain power until they’ve purged all their former leadership. Why do you think it is that no Australian government has been turfed out within one term since 1932? At least in part it’s because the opposition’s former leadership group can’t see it’s their duty to depart. Just like a Minister, they owe a duty to the party to move on. Howard’s team did and it assisted the Liberals. There’s a whole other column in the nexus between Conroy’s power base and that of Bill Shorten, but the point is exactly the same as for Sinodinos. Both may be good men. There are, however, alternatives. The stakeholders are the people of Australia. Directors will be held to the most exacting standards. Move on and make room for others. The Taiwanese deserve another newspaper column from you. Who cares about Taiwan - hand it back to China and end the farce. It was merely an old Nationalist stronghold with no value at all now. Hong Kong has already been returned, now its Taiwan's turn. Hmm... you don't know much history, do you? Nic Stuart for Governor-General. Then it would be Sir Nicholas..